After being in limbo for almost 16 years, with no review of its role since 1998, the South African National Defence Force (SANDF) now has a new blueprint for the future. The 2014 Defence Review was approved by cabinet and has been cleared for publication, following a lengthy process that started in mid-2011. It takes into account South Africa’s increasing role in peacekeeping in Africa and will form a basis for funding allocated to the military. However, the strategy should be implemented soon to stop the decline of the defence sector that has resulted from a lack of funds and overstretching of its capabilities. Years of under-spending and a mismatch between missions and funding have had dramatic consequences. 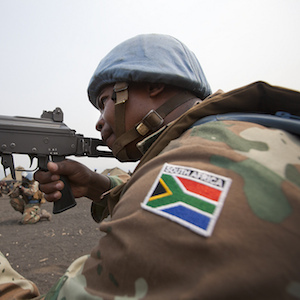 For example, where the 1998 Review provided for one battalion to be deployed externally for a year, the SANDF has had at least two battalions deployed for peacekeeping since 2001 – three for a decade and briefly four – along with smaller elements. Today it has a battalion group in the Democratic Republic of Congo (DRC), plus a battalion in Darfur and a frigate in the Mozambique Channel. In the interim, the government also changed its mind and instructed the SANDF to again take over responsibility for border safeguarding. Defending and protecting South Africa: this covers deterrence, defence and protecting vital national interests outside of South Africa – such as critical sea lanes, Maputo port and Cahora Bassa and the Katse dam in Lesotho. Looking forward, it would include Namibian and Mozambican gas fields and future investment in the DRC. Safeguarding South Africa: this covers air, land and sea borders, critical infrastructure, co-operation with the police and information security. Promoting peace and security: this covers improving strategic influence through enhancing defence diplomacy and cooperation, and participation in peace support missions. Developmental and other tasks: this covers treaty obligations, such as search and rescue and hydro-graphic surveys; executing ‘ordered presidential tasks’ such as VIP transport; assistance to the civil authority (for example, disaster relief); and contributing to national development. The Defence Review considers each of these tasks and proposes a ‘level of effort’ for each – a capability level to reasonably ensure success. In this, it differs markedly from the 1998 Review, which focused on expected funding levels and developed a force design to fit, with little or no consideration of actual mission requirements. The consequences of that approach are visible today in examples such as the lack of transport aircraft to reinforce the troops in Bangui, the Central African Republic (CAR) when they came under attack from Séléka rebels last year; the lack of maritime patrol aircraft to monitor our waters and the Mozambique Channel; the force of four frigates when it was clear that six were required, and so on. Having analysed the developing strategic situation in Africa along with South Africa’s vital interests and security, the Review proposes a ‘defence development trajectory’. It begins with ‘arresting the decline’ by 2015, ‘rebalancing’ the SANDF by 2018 then ‘capacitating’ it by 2023 to handle current missions without damaging itself in the process, to develop the capability by 2028 to respond to new challenges. Those four milestones form the key recommendations of the Review, with the budget rising from the current, utterly inadequate 1,1% of GDP to 1,6%, 2% and then 2,4% of the present GDP. There is also a fifth milestone: the ability to deal with a limited war situation. But that is not seen as even a medium-term requirement and no timescale is set for it – although a budget of about 3,3% of present GDP is estimated to be necessary for that purpose. Priorities within the first four milestones include strengthening the Special Forces and developing true rapid deployment capability, along with the requisite air- and sealift, for crisis response operations as well as border safeguarding. There is particular focus on maritime borders and zones and on air space control. Then comes developing an improved capacity to participate in peace support missions, which includes acquiring the appropriate vehicles, and re-equipping the mechanised force. Only then comes the re-equipping of the main ‘heavy force’. Returning to normal military organisations and normal command and staff functions, the army bringing back brigades and divisions and the navy grouping its vessels into squadrons. The air force is somewhat out of step here – dangerously so in separating the Rooivalk attack and Oryx transport helicopters under ‘combat capability’ and ‘mobility capability’ respectively, oblivious to the need for the two to live and work closely if they are to be effective. No provision is made for a dedicated special operations element. Greater devolution of authority, responsibility and accountability through the command levels, with focus on operational unit and formation commanders. A strong focus on professionalising the officer and non-commissioned officer corps, with major restructuring of the selection, education, training and development systems as well as focused career planning and management. A return to a normal military disciplinary system that ensures a fair and swift response to minor transgressions. This would prevent young soldiers from receiving a criminal record for something that does not justify it, and removes the problem of having soldiers in a unit pending trial. Streamlined and more efficient management systems, including decentralised procurement of routine supplies. This enables units to purchase supplies locally to the benefit of the local community. Finally, the Review also sets out a defence industry policy as the basis for new acquisition and industry strategies, which will allow the SANDF to be equipped in a more efficient and flexible way. This policy sets out areas in which South Africa must have its own capabilities – for instance support of equipment in service and system integration. Other aspects include local manufacture of key munitions, batteries and spares, as well as the development of optimised equipment where that is justified. This Defence Review does not pretend to present all of the answers. Not only is the strategic situation much too dynamic and fluid, it also leaves the matter of force design to the Defence Force. However, it does set a baseline from which to begin rebuilding the Defence Force, with the planned five-yearly reviews keeping that process aligned with strategic realities.